Trapped in flasks by resolute scientists, bacteria do their best to survive. 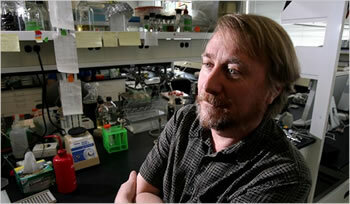 Dr. Richard E. Lenski has kept his E. coli bacteria captive since 1989. For more than 40,000 generations, these hardy organisms have known nothing but the world that Dr. Lenski has created for them. Over time, the bacteria have evolved. They are twice as large as their common ancestor. They are also quicker to reproduce, dividing 70 percent faster. The bacteria have also evolved solutions to the torture tests devised by Dr. Lenski. He created 12 identical lines of E. coli and then fed them short rations of glucose. Out of sugar by afternoon, most would die; Dr. Lenski transfered the few survivors to a fresh flask. The bacteria evolved quickly, reproducing faster. Evolution tended to follow the same path in the 12 different sets of bacteria. Dr. Lenski's work with captive bacteria has also provided us with more information about antibiotic resistance. Antibiotic resistant bacteria have become a serious problem around the world; the costs of new anti-biotics have skyrocketed in a sort of pharmaceutical arms race. In a 1998 paper, Dr. Lenski demonstrated that once bacteria have adapted to antibiotics, the resistance gene remains in the population long after the antibiotics are withdrawn. Simply suspending the use of antibiotics becomes a less effective tool over time. Other scientists have been working in this area as well. Bacteria adapted to 68 degree cold were forced to adapt to 104 degree heat. E. coli are forced to adapt to a new diet of glycerol (found in soap). As the organisms adapt, scientists learn more about how evolution works. This strategy was suggested by several science fiction writers. In Theodore Sturgeon's famous short story Macrocosmic God, published in 1941, a scientist imprisoned tiny creatures he called Neoterics in an escape-proof habitat, and forced them to solve problems for him. He couldn't speed up mankind's intellectual advancement enough to have it teach him the things his incredible mind yearned for. he couldn't speed himself up. So he created a new race - a race which would develop and evolve so fast that it would surpass the civilization of man; and from them he would learn. A similar strategy was proposed several years earlier by science fiction writer Edmund Hamilton in his 1937 short story Fessenden's Worlds. Eccentric scientist Arnold Fessenden altered the destinies of solar systems, often destroying entire civilizations. "Fessenden's eyes had been following my stupefied change of expression. He said calmly, "Yes... it is true. That is a tiny, self-sustaining universe, with its own suns, nebulae and worlds. Via Fast-Reproducing Microbes Provide a Window on Natural Selection and Bacterial evolution and the cost of antibiotic resistance.